Nunez shakes hands with junior Steven Wasserman during the lunch period. Ernesto Nunez, better known to the students and faculty at CHAMPS Charter High School as “Ernie,” is typically the first face students see when arriving at school each morning. He stands on Van Nuys Boulevard ushering student pedestrians and carpool drop-offs away from the bustling street. With signature black sun glasses upon his bald head, he smiles and greets each and every student beginning nearly an hour before the warning bell rings. “Hi, boy, have a good lunch…healthy, healthy,” Nunez said to a student as the upperclassman leaves campus for lunch. “George! No ditching class,” he teases to another. Nunez sometimes arrives at CHAMPS at 7 a.m., and stays until long after dark to make sure that students leave after-school rehearsals safely. However, he vows never to let his dedication to his work compromise time he spends with his family. He is the father of four children, all high school graduates between the ages of 21 and 42. “Ernie’s super cool. He always smiles at me. He always waves when we drive up in the morning. He’s a cool dude,” said Nicole Sanchez, a senior. While Sanchez has witnessed a myriad of security guards come and go, Nunez has been a constant aspect of her campus life for four years. She recognizes him for his infectious smile. The cheerful security guard was raised by a single mother on the poorest, gang-infested streets of Los Angeles, after immigrating from Mexico with his immediate family following the murder of his father. By the age of 16, he was providing for his four younger siblings, all of whom he is in close contact with today. “He always has a kind word to say. He’s just there wanting the best from our students,” said Marshall. 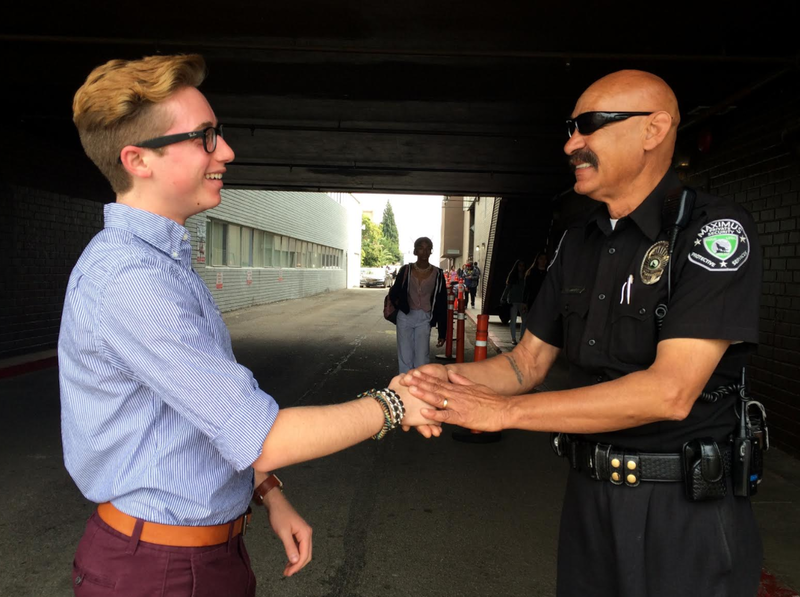 JOEY SAFCHIK (JS): Ernesto Nunez, dubbed “Ernie” by the students and faculty at CHAMPS Charter High School of the Arts, is famous on the small campus for his ever-present smile and ritualistic fist-bumps, which serve as the security guard’s daily greetings. STEVEN WASSERMAN: He greets you every day with a firm handshake and a big smile. JS: That was Steven Wasserman, a junior and the vice president of the student body at CHAMPS. Nunez has been directing the flow of carpool traffic and ushering students across Van Nuys Boulevard for the entirety of Wasserman’s high school career. ERNESTO NUNEZ (EN): I lost my regular job six years ago and it was tough for me to support my family. I’m the head of the family and I couldn’t get a job, so I found this and I’m happy for that. JS: Nunez’s journey has not been easy, and he is constantly remarking that he can “do better.” Nunez was born in a small village in Mexico, and immigrated to L.A. at the age of 9, after his father was killed. His single mother journeyed to America with her five children in hopes of giving them a secure education. He grew up in Boyle Heights, a city that was engulfed by gang culture throughout the late 20th century. In 1992 alone, there were 97 homicides, over half of which were gang-related. EN: And we were poor. My mom had to work two jobs to give us the basics and I started growing up there. But you see the difference between right and wrong and I witnessed that since I was little. JS: Nunez has the mentality that love and support can push a person to achieve more than they thought possible, and he puts that theory to the test every day at CHAMPS, where he does more than check student ID badges. EN: If I can say the right words to them. Maybe I’ll make the difference. Instead of being a soldier, you can be their friend. ‘Cause if you’re a soldier, they’re gonna be afraid of you and they’re gonna keep away from you. Instead of going towards you they’re gonna go to somebody else. AMELIA MARSHALL: Mr. Nunez is by far the family favorite. JS: That was Amelia Marshall, the vice principal at CHAMPS, who works closely with Nunez. The security guard has been wearing multiple hats for many years. Although he says he was an ambitious student, he made the difficult decision to drop out of school before completing 11th grade at Roosevelt High School, in order to work at a car wash and help his mother pay bills. EN: I feel like I could have done at least high school back in my days. Because wherever you go nowadays, even if you’re a dishwasher, they’re gonna ask you for the high school diploma. JS: Because Nunez makes a point of individually addressing each student he sees every day, and talking to many of them on personal levels, he does not feel as under appreciated as he thinks other security guards might. However, he absolutely does not consider himself a hero. In fact, he laughed out loud when I called him one. EN: I got the sense from the students and parents that I was doing good. So it makes me feel good inside my heart. When I go home, I feel a lot better. Even though we have a lot of obstacles in life, we can do better. Nunez socializes with students before they leave campus on their lunch break.